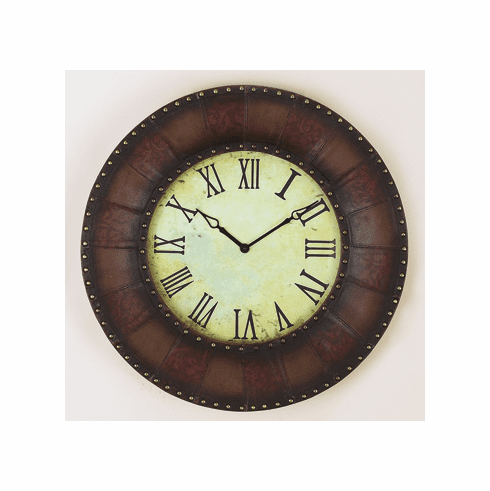 This large 32.5" clock features a 19" clock face inside a heavy solid wood frame. Over the wood frame is a combination of Genuine and Faux leathers, giving it a very distinguished look. Around the edge as well as around the clock face there is a leather border, held by brass colored studs. The numbers are large and easy to read, which is a desirable quality in any clock. Mounts using 2 screws or nails. Requires 1 "AA" battery (not included). Requires 1 "AA" battery (not included). Dimensions: 34" x 34" x 2.5"